Spring is almost here and, if you live in the country, you might be thinking about pruning those fruit trees in your yard. 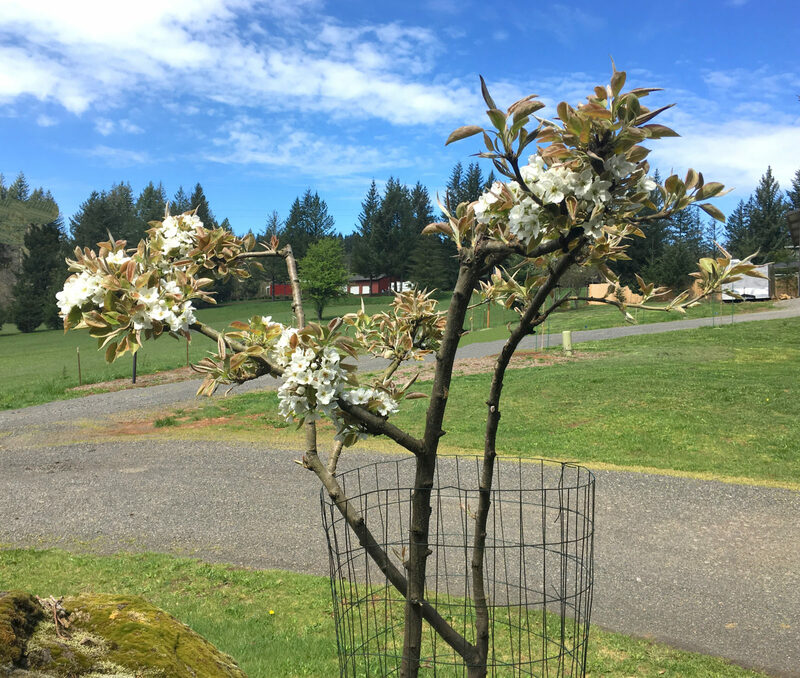 Growing fruit trees is not a passive activity – especially on rural property where you often find lots of them. They actually require year-round attention for optimum health and better fruit production. Obvious chores include watering and fertilizing during spring and summer. But trees also require attention during the winter, even though they are mostly dormant for that season. In fact, late winter is the ideal time for pruning and spraying – hence the term “dormant” oil for the type of spray used. Cutting off branches from a healthy tree might seem counterintuitive. But careful pruning removes unproductive branches and shapes the tree to produce healthier fruit. After pruning, we spray a light mineral oil that is compatible with organic gardening – no fungicide or herbicide. The oil coats the branches and seals it from mites and other bugs that might show up during the spring bloom. For ideal conditions, trees should be dry with no foreseeable precipitation for at least 24 hours. Likewise, ideal temps should be close to freezing. Although in some areas, you may be able to prune as late as April as long as the trees have not sprouted leaf buds. This past winter was a real challenge because it was so wet. Our continuous days of snow and freezing rain made it nearly impossible to get out and take care of the trees. Finally, with dry weather and temperatures still below 40, we found a perfect day in March. While pruning is not that hard with the right tools, it helps to know what you want to accomplish with the trimming. A fruit tree continues to grow throughout the year, producing new shoots from its limbs. Unless these shoots have fruit buds, they need to be pruned off. Otherwise, they divert nourishment from the branches that have fruit. Pruning helps direct the nutrients from the tree trunk to branches with fruit. Likewise, the shape of the tree can determine how productive and healthy the harvest will be. There are several schools of thought about this, but we prefer to prune the center lead (trunk) out. This helps the outer branches spread out and grow into an umbrella shape. The open center allows more air circulation and sunlight into the remaining branches, which helps blooming. This approach also makes it easier to harvest – as the outer branches bear fruit, they tend to bend down, making it easier to reach. Proper pruning can help shape a tree into ideal production. You will often see a mature fruit trees laden with fruit at the very top branches. This makes the fruit nearly inaccessible when the tree hasn’t been pruned regularly. We had a few mature trees on our property when we moved in four years ago. They were overgrown with misshapen branches that criss-crossed inside the canopy. This not only creates a tangled mess, it also invites bugs and disease. And, of course, the harvest was lacking. So, two winters ago, we did a dramatic pruning that cut back many of the thick, older branches, and opened up the centers. It is a scary proposition and, again, counterintuitive because it looks like the tree will die from all that major surgery. Plus, trees often appear to “suffer” because they will skip a year in production as they recover. However, after a major pruning, trees usually bounce back, and are healthier for it. And that was the case with our trees – there were no apples last summer. But spring weather has brought tons of flowering fruit buds, and the trees are thriving. Plus, this summer, as the lower branches fill out, the fruit will be a lot easier to reach. Next winter, we will able to return to light pruning. So don’t be afraid to trim your trees after you’ve determined how you want them to look. Regular pruning and dormant spray will keep them healthy and producing for years. If you’d like to hear more about life in the country, with Nature as Neighbors, write or give us a call. The National Association of Home Builders has released its Home Buyers Survey for 2019, indicating the top features home buyers want most. Although extremely helpful for new home builders, homeowners who are thinking about selling should also pay attention. The survey identifies 175 items that are rated “essential”, “desirable”, “indifferent” and (just as important) “do NOT want”. An interesting note is that, while baby boomers trended along with general home buyers in desirables, they have stronger opinions about what they do and do not want. 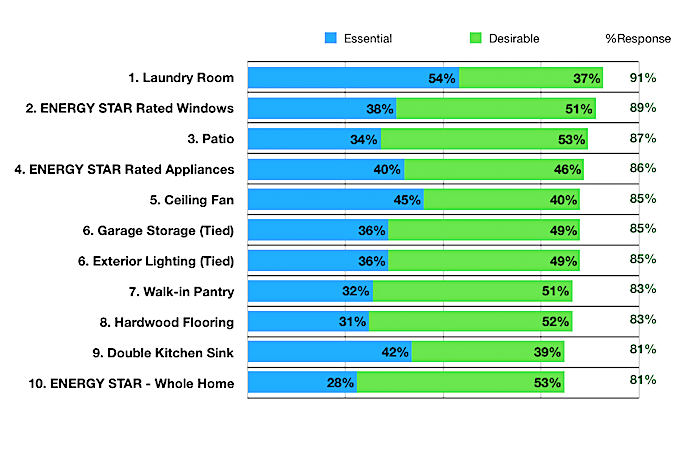 Some features are not surprises – energy efficiency shows up (explicitly or implied) as four of the top 10 items. Surprisingly, laundry rooms are at the top of the essential features buyers want. Although this factors in with the other items baby boomers desire – smaller homes with single-level living and open floor plans. Having a laundry room keeps clutter out of view and helps keep smaller homes organized. Ceiling fans are also big – arguably consistent with the energy efficiency theme. Also, consistent with baby boomers’ desire for one-level living, elevators were rated the least desirable feature in a home – one that would cause them not to buy it. Although – another surprise – this was not as much of a deal killer of buyers from other age groups. While this survey can guide new home construction, by building in features from the start, it also can help sellers of existing homes. Adding a laundry room is not on the list of the best returns for home improvement projects. However, there may be other areas in the home that can be converted easily – like a closet in a bathroom with room for a stackable. Or, even the garage might be an option. Access to utilities will determine the ease and expense of such an addition. If you are thinking about selling your home, and want to know what buyers really want in a home, contact us. We specialize in view homes on acreage or large lots with “elbow room for the soul”. This not only provides homes with plenty of privacy, but also homes that are well-suited for multigenerational living – households with different generations living together. According to the most recent 2016 study by the Pew Research Center, 1 in 5 homes in the U.S. are now multigen. This trend is likely to continue as one way to address caring for the elderly in a rapidly aging population. Some homes come with separate living quarters, some need to be modified to provide that space. We live in a multigen home, so we know how to find homes suited for this lifestyle. If you have a home that has multigen features and you want to sell, call us – we are specialists in this field, and we have buyers ready to move! Many of our ViewHomes of Clark County buyers prefer a home with a 3-bay garage. The reasons vary, but the bottom line is needed space. And as the photo shows, the single car garage in Barbie’s Dream House ( a gift for my granddaughter’s upcoming 4th birthday) is already full. 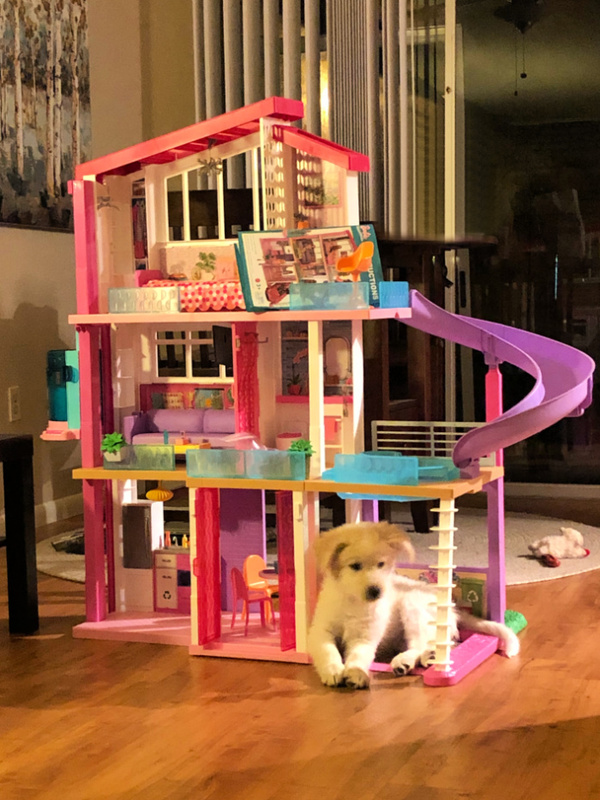 One parked puppy, and suddenly there’s no room for Barbie’s signature pink convertible. Not to mention her SUV, or Ken’s motorcycle. Barbie is an active woman too. 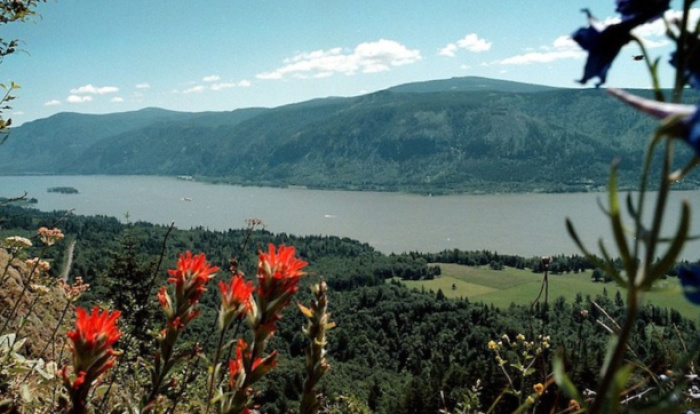 Where will she store her camping gear, skis, bikes, jet-ski, and scuba equipment? Here are some of the most common reasons we hear from buyers seeking a 3-car garage. And, what we see in garages when previewing ViewHomes™ prior to listing. Lawn Mowers, pressure washers, etc. We completely understand the added value of a home with a 3-bay garage. The cost difference when purchasing a home with a 2 car and 3 car garage will vary, but generally speaking, it can a lot of value. For example, in Camas, Washington, a home with a 3-car garage sells for about 8% more than one with a 2-car garage. In our opinion, the added value is also about preferences and perceptions. Given the current preference for having 3 bays, it makes sense to have a home with the amenities that are most desirable. CC&Rs ( Covenants, conditions, and restrictions), or zoning restrictions might prohibit building a shed, or another type of outbuilding for extra storage space. Keep in mind though, if the first impression of the house is garage-centric, the curb appeal can be greatly reduced – and perhaps, the value. Oh look, it’s a garage with a house attached! We’ve all seen them. In more rural areas, where homes tend to be older, many properties have decent sized 2-car garages, with various outbuildings. Zoning often makes it possible to add sheds, RV garages, shops, and barns to make up for any loss associated with the lack of a 3rd bay. If you’re interested in listing your home with a 3-car garage in Clark County, we know how to price it fairly, and market it to the right demographic. Buyers, we know where to find the view homes with 3 car-garages, and other options to suit your specific needs. Call us today, we’d love to help. 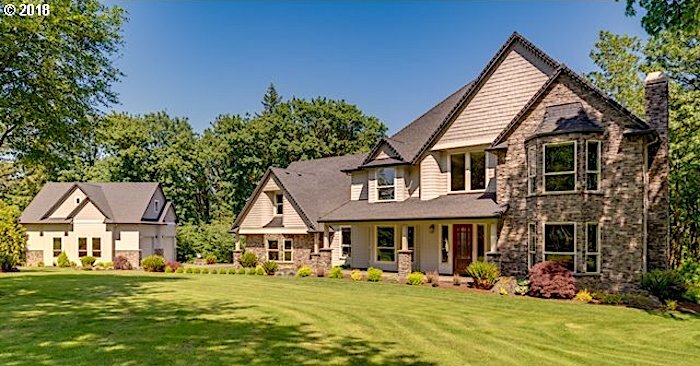 Begin your search here for homes with 3-car garages in Camas.